This page features news items from 2011. Some of the information included here may now be out-of-date and this page is here for reference purposes only. To help keep track of the various re-issues and releases of Ant's catalogue, we've added a new page which provides a summary of them which can be seen here. Links for ease of on-line ordering are also included. Update: The information on the page has been amended further to include some of the older releases and also to reflect recent changes in the availability of some titles, including Field Day and the double CD re-issue of Sides. A second page has also now been added, detailing those titles from Ant's back catalogue which are not currently available. The German label Repertoire Records are to due to release a re-issue of the first Genesis album From Genesis To Revelation in the near future and Ant has recently done an interview with music journalist Chris Welch which will be included in the liner notes. An article about the album which includes Ant's comments has been published on Repertoire's site and it can be read here. Update: The Repertoire re-issue of From Genesis To Revelation is now scheduled for release on 14th November. The latest episode of the online magazine programme 'The Irrelevant Rock & Roll & Music Show' is a programme entitled The Branches of Genesis: Anthony Phillips & Steve Hackett, Part 2. As the title suggests, the programme is the second to feature a discussion of how Ant and Steve's solo careers developed following their respective departures from the band and can be heard here. The first programme is still available online and can be heard here. Thanks to the show's co-host Chris Rutty for passing on the details about it. Ant's 2005 release Field Day has been out of print for the last few months but we are pleased to announce that the album is now available again. Field Day is a double CD of pieces based around acoustic stringed instruments in both solo and duet form and as well as the usual 6-string and 12-string guitar pieces, Ant also composed and recorded new pieces for the album on charanga, English bazouki and cittern. Field Day can be ordered from Gonzo and Amazon. The latest episode of the online magazine programme 'The Irrelevant Rock & Roll & Music Show' is an interesting programme entitled The Branches of Genesis: Anthony Phillips & Steve Hackett, Part 1. As the title suggests, the programme features a discussion of how Ant and Steve's solo careers developed following their respective departures from the band and can be heard here or here. A small but significant step for us: today marks the tenth anniversary of the day (2nd April 2001) that Ant's official site went 'live' for the first time. We would like to take this opportunity to thank our visitors for their continued interest in Ant's music and the site itself - it is very much appreciated. We are currently busy working on a selection of brand new content for the site which will be published over the coming months as well as an overall upgrade of the existing content which we hope to launch in the not too distant future. An official promo video clip for She'll Be Waiting - from the recently re-issued Private Parts & Pieces IX: Dragonfly Dreams. The clip can also be viewed on Ant's official YouTube channel where you can also see our previous promo clips for Pathways & Promenades and the re-issue of the first two Private Parts & Pieces albums. In May last year Ant did an interview with Jason Saulnier for his show on CIFA Radio in Nova Scotia, Canada. The interview is now available to listen to online - Ant demonstrates his impressive knowledge of Nova Scotia at the beginning before answering a selection of questions. The interview can also be accessed via Jason's site here. Ant's official Facebook page can be found here and if you have not done so already then you are cordially invited to join us. The page is run on Ant's behalf and with his full approval - Ant does not have a Facebook profile himself but we do pass on comments and messages posted on the official page to him. We should add that any other page on Facebook purporting to be him (or about him) that you may see has nothing to do with Ant and he will not see messages posted on it. Two further re-issues from Ant's back catalogue are out now. The first is a re-issue of the ninth and tenth albums (Dragonfly Dreams and Soir�e) in the Private Parts & Pieces series as a double CD. 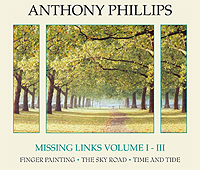 The second re-issue is of the first three albums in the Missing Links series (Finger Painting, The Sky Road and Time & Tide) as a triple CD set. The three Missing Links albums have brand new artwork whilst Soir�e has a new cover which is incorporated as part of the two-for-one design. Private Parts & Pieces IX: Dragonfly Dreams was originally released in 1996 and includes a number of collaborations between Ant and Quique Berro Garcia. Private Parts & Pieces X: Soir�e was first released in 1999 and was the second collection of pieces for solo piano that Ant has released. The Missing Links series was begun as a way to fill in some of the gaps in Ant's commercially released musical output and allow fans the opportunity to hear some of his Library and Television music. The series began in 1989 with the release of the first volume Finger Painting (initially made available as a limited edition cassette release) which featured selections from various projects that Ant had written and recorded over the previous ten years. A second volume - The Sky Road - followed in 1994, featuring a further selection of Library and Television pieces alongside previously unreleased album pieces and archive tracks. The third volume - Time & Tide - was released in 1997 and brought together for the first time on a commercial release the best of Ant's collaborative work with Joji Hirota, much of which has been featured on award-winning programmes in the long-running Survival series. The albums included in these titles are being re-issued to make them available again and therefore - contrary to what you may read elsewhere - they have not been re-mastered for these releases. Both titles were released on 24th January and can be ordered now. 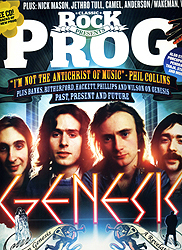 The current issue of the UK music magazine Classic Rock Presents Prog which has recently been published contains a small interview feature with Ant as part of a large feature about Genesis. The same issue also includes a countdown of the top 25 most influential Genesis songs - interestingly, White Mountain is listed at number 23 in the countdown and The Knife made it to number six. The magazine includes features on established artists as well as up-and-coming prog rock acts and also comes with a free CD. More information about the magazine can be found on the Classic Rock site.